A healthy immune system is essential to maintaining good appetite and proper bowel function. STARTER'S mode of action is by supporting the calf's immune function and enhancing the digestive process by seeding the digestive intestinal tract with selected micro-organisms. These microflora support the immune system and allow the calf to better-digest it's food and perform other esential functions. STARTER is not a substitute for fresh, first-milking colostrum. STARTER does not contain IgG's (immunoglobulins). Colostrum contains nutrients, antibodies, hormones, bio-active peptides and enzymes and they are unique to first-milking fresh colostrum supplied by the dam. 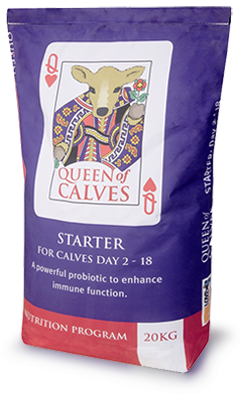 Queen of Calves™ FINISHER is made from plant extracts, (selected marine and land plants) essential amino acids, beneficial bacterium (probiotics), prebiotics and vitamins. Queen of Calves FINISHER is stage II of the program called "The Queen of Calves Nutrition Program™'. 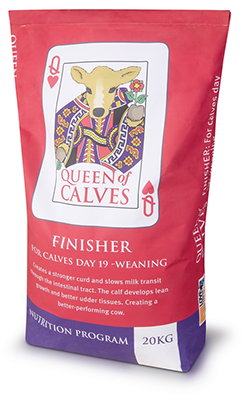 There are thought to be a number of beneficial effects from the use of both Queen of Calves products. However, a stronger curd formation that occurs when FINISHER is added to milk, has been demonstrated to lead to slower stomach release. Through the process of slower release to the small intestine, it provides an opportunity for greater nutrient absorption and reduces the potential for nutritional scouring. By optimizing the efficiency of absorption of the milk component of the diet and encouraging early development of the rumen, the Queen of Calves Nutrition Program enables the calf to extract more energy from the total diet. In doing this, the benefits of rapid, early lean growth have been shown to result in a calf that transitions better to a forage diet and to perform more efficiently as an adult.